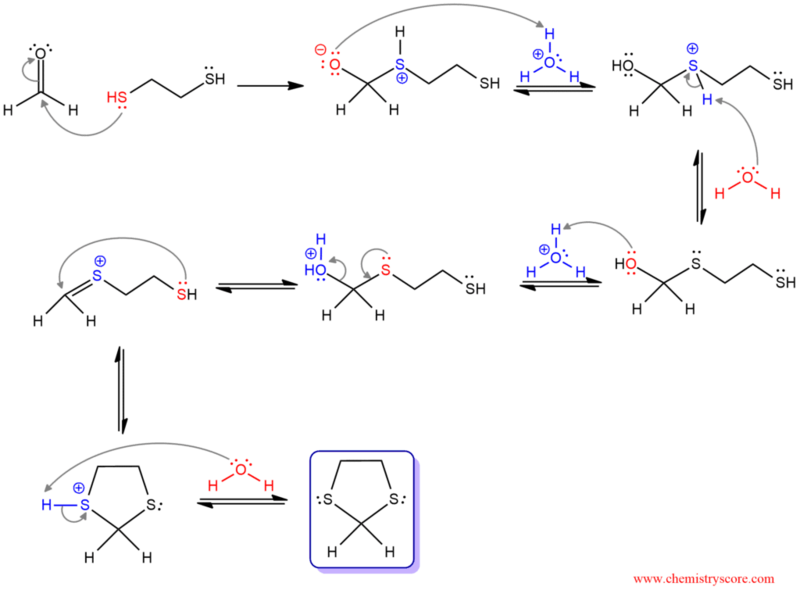 In analogy for the formation of acetals from alcohols and acid, treatment of aldehydes or ketones with thiols in the presence of an acid produces a thioacetal. Sulfur is located in the same group just below the oxygen and can be expected to have similar properties. 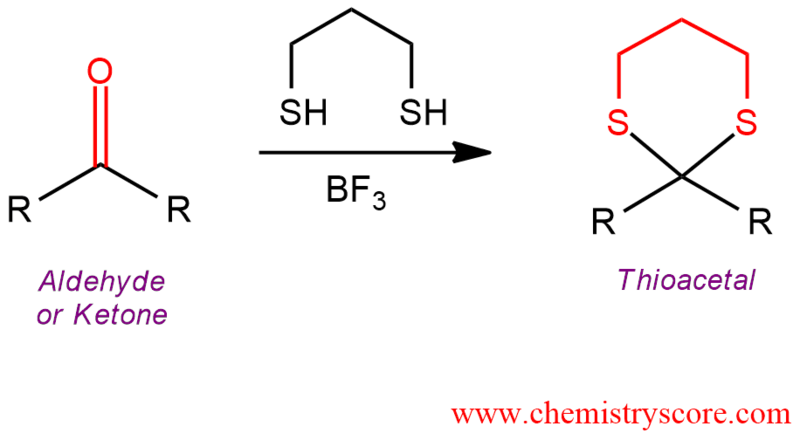 Thiols are sulfur analogs of alcohols and they can react with aldehydes and ketones in the same manner and produces thioacetals. As the catalyst is used a Lewis acid, such as BF3 or ZnCl2. However, in the contrast of acetals, thioacetals are stable in both aqueous acid and aqueous base. They use usually to protect carbonyl group and differentiate two different carbonyl groups in the same molecule. Sulfur with its lone pair function as a nucleophile and attacks the carbonyl carbon. The π carbonyl bond breaks and oxygen become negatively charged, and sulfur positively. In acidic conditions, the negatively charged oxygen captures proton, and in the next step, water removes the proton from sulfur making neutral intermediate. Then, the hydroxide is protonated and become a good leaving group that is expelled in the next step. Another sulfur with its lone pair attacks the carbon making a cyclic compound. And in the last step, water removes the proton from sulfur and generates the final product – cyclic thioacetal. Hydrolysis of thioacetals is carried out using mercuric chloride in aqueous acetonitrile. Thioacetals can also be desulfurized to the corresponding hydrocarbons by treatment Raney-nickel which is used to convert a carbonyl into a methylene group under neutral conditions.